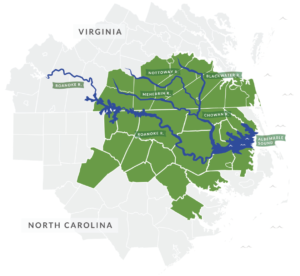 The Enviva Forest Conservation Fund (EFCF) is a $5 million, 10-year initiative designed to protect and conserve tens of thousands of acres of sensitive bottomland forests in northeast North Carolina and southeast Virginia. The EFCF, which is being administered by the U.S. Endowment for Forestry and Communities (Endowment), will award matching-fund grants to nonprofit organizations to protect ecologically sensitive areas and conserve working forests over the next decade. The goal is to attract additional conservation investments to the region and preserve 35,000 acres of bottomland forests. At its outset, the EFCF will focus on about 35 North Carolina and Virginia counties that include 6 million acres of forests of all types. Of this total, about 20 percent are bottomland forests – low-lying, marshy areas near rivers and streams that are home to tree species such as cypress, gum and oak. This area is also home to three wood pellet production facilities and a deep-water marine terminal owned by Enviva. In addition to the $5 million grant program, the EFCF also includes two other initiatives that will protect the region’s forests and environmentally sensitive areas. First, through consultation with leading academic and environmental organizations, the Endowment has identified four specific bottomland forest ecosystems that will be priority conservation targets. Enviva does not take wood from these sensitive areas and is working with its suppliers and landowners to preserve them. Second, the Endowment has appointed a panel of experts to develop enhanced, science-based forestry practices for working bottomland forests. This “blue-ribbon committee” will recommend specific policies and procedures that Enviva intends to incorporate into its supply practices. Ducks Unlimited: The Fund is providing $175,000 to assist with the acquisition of more than 6,000 acres in Camden County, North Carolina. The property is designated as wetlands and includes pocosins and Atlantic white cedar stands, which are bottomland forest ecosystems that the Fund has designated as priority conservation targets. Once acquired, this property will be owned by the state and open to the public as a Wildlife Management Area. North Carolina Coastal Land Trust: The Fund is providing $200,000 to help acquire 1,000 acres in Bertie County, North Carolina, for creation of a new State Natural Area with public access. The property includes a mature cypress-gum swamp along the Chowan River and Salmon Creek. It also is the site of an archaeological study to determine if this property is where members of the Roanoke Island “lost colonists” may have relocated for a time. Virginia Department of Forestry: The Fund is providing $125,000 to support a conservation easement on more than 1,000 acres in Sussex County, Virginia. This project blends working forest uses with permanent protection of bottomland forests including mature cypress/tupelo stands and a natural area set-aside to protect the state rare Savanna Panic Grass (Phanopyrum gymnocarpon). To learn more about the Enviva Forest Conservation Fund and to apply for an Enviva Forest Conservation Fund matching fund grant, please visit www.envivaforestfund.org.